Paris. If anyone can sum up that city in just a few succinct paragraphs, I would be highly suspicious of how much they actually experienced. After a mere five days of total immersion in the city’s culture I was overwhelmed to the point of speechlessness by all of the words that could be said and the stories that could be told. Yet, I returned home brimming with inspiration, and headed straight to the kitchen as soon as we walked through the door. Suitcases still stuffed, with both dirty laundry and happy memories, the familiar scent of buttery pastries began floating through the air, as if we had never left Paris at all. This time, however, I could actually enjoy those flaky delicacies, instead of solely photographing them, because these were my very own vegan croissants. Though they aren’t quite as grand as the massive breakfast confections in Paris, these miniature vegan croissants compensate for their two-bite size with a richness that can easily quell any hunger. Despite how intimidating the paper-thin layers may seem, vegan croissants are actually quite simple to make; it’s the waiting and repetition that might become a bit trying. Luckily, I found a recipe for “quick” croissants, which simplifies the process and produces fresh, homemade pastries in about 3 hours (including resting and baking tmes). 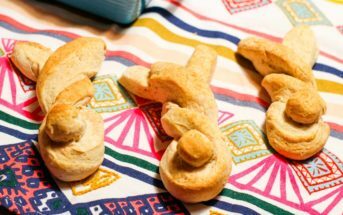 Adapting it to better suit my American cups and teaspoons, while also easily making the recipe dairy-free, this is definitely a good starting place for anyone who wants to give vegan croissants a try for themselves. Please note that the Prep time is hands on time and does not include hands off time of resting and rising. To make the dough, start by combining all of the dry ingredients together in a large bowl until well distributed. Add in the water and melted margarine, and stir thoroughly to incorporate. Mix everything together and knead until a smooth dough is formed. Let rest in the fridge for 20-30 minutes. Turn the dough out onto a floured surface and knead by hand for about 10 to 15 minutes, until smooth and elastic. Place in a lightly greased bowl, cover with plastic wrap, and let rest in the refrigerator for about 30 minutes. While the dough chills, prepare the “butter” block. It helps to start by cutting the margarine into sizable chunks and arranging them right next to each other in as even of a rectangle as possible on top of a silpat or piece of parchment paper. Sandwich the margarine in between another silpat or sheet of parchment paper, and using your rolling pin, whack it into submission. You want to flatten the block out to about 1 cm or so high, and try to keep the sides even and rectangular. Allow it to chill in the fridge for 20-30 minutes. Once properly chilled, roll the dough out into a rectangle about twice as large as your “butter” block. Place the “butter” block in the center, diagonal to the sides (not parallel.) Enclose the block like an envelope, bringing the corners of the dough in to meet at the center. Roll the whole thing out gently to a thickness of about 1 cm again, and fold the short sides in by thirds. Return it to the fridge so that it can chill for another 20 minutes before proceeding. Don’t be tempted to hasten this time, as the heat from your hands and the rolling pin will make all of the margarine melt and run out. It’s essential to keep this dough as cool as possible before it hits the oven! The folding and shaping process is rather difficult to describe in words, so don’t worry if you’re a bit confused. Just check out the very helpful photos over at WikiHow and Joe Pastry if you need a visual aid. 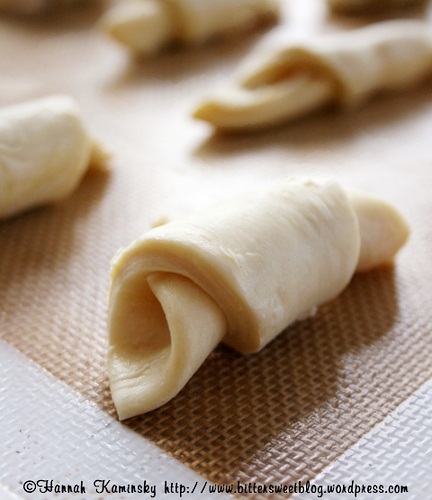 Roll out the dough into a rectangle yet again, and fold in thirds as before. Chill for the same amount of time, and then repeat this process once more. Chill the dough for 20 more minutes before shaping it. To shape your croissants, roll the dough out into a rectangle as before, but cut it with a very sharp knife into equal triangles. 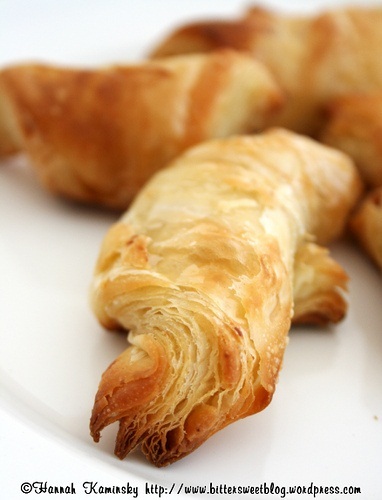 If you want mini croissants, cut the dough in half lengthwise first, and then cut your triangles. Roll each triangle up, starting at the widest side, and the place each one on a fresh silpat or piece of parchment paper. Once all the croissants are cut and rolled, let them rise in a warm place for about 75 minutes, until nearly doubled in size. After rising, move the croissants into a preheated 415ºF oven. As soon as they’re safely inside, reduce the heat to 350ºF, and do not open the door again until 15 minutes has elapsed. They should be golden brown, but if not, bake for an additional 5 to 10 minutes as necessary. Let cool before serving. Editor’s Note: Hannah says a stick margarine is really needed for best results rather than a tub version. We recommend Earth Balance Buttery Sticks since they are free from hydrogenated oils and dairy-free / vegan. So you REALLY need to modify how long these take to prepare…with all the resting and rising this is more like a 4 hour process…not 45 mins. I’ve added a note for you. Prep time is hands on time. Sorry for any confusion it might have caused you. Thank you very much! We are going to try these tonight. Hi Rex, I don’t think it’s a typo, but likely just an estimate that isn’t quite spot on. I would say more like 1/2 centimeter. Do you think I could sub whole wheat pastry flour or a mix of whole wheat flour and unbleached white flour? I have those on hand, so I thought I’d ask before going out to buy bread flour. The results will be much heavier Ellen, so I can’t guarantee results. It might work! Just want to say “thank you for your website!” You are quickly becoming my go-to for dairy free baking. I’ve made your cinnamon rolls a couple of times, and they’re a hit with my husband and son, who do not share my dairy allergy. Thanks for putting the work into sharing your knowledge! Can it be adapted to gluten free too? Probably, but it would take some experimentation. You could trial with your favorite gluten-free all-purpose mix (with xanthan or guar gum), but adjustments may need to happen from there. Not yet! Sometimes you have to dive in 🙂 Since it is egg-free, you can reduce the recipe to make a mini batch – less risk! Oh, and you will need some xanthan, guar gum, or other good binder if trialing gluten-free. Hi can I substitute vegetable oil for the margarine ? Or is the margarine better for flavour or texture? 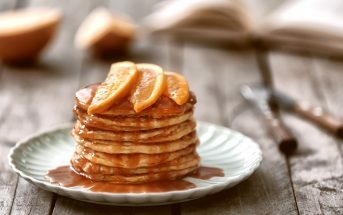 Margarine works best in this recipe, though you can use non-hydrogenated dairy-free margarine (like earth balance) or non-hydrogenated palm shortening (which is palm oil). You could sub coconut oil, but may want to use a bit less.